Managing to buy and live in a house that you worked hard for is one of the best joys in life. If you are ready to achieve that milestone, why not consider purchasing modular homes for Goldsboro families? We guarantee that these prefabricated houses will be everything you need and more in a place you can call your own. Buying a new house is a big decision for most people. With various housing options to choose from, such as modular homes, Goldsboro residents need to be sure that they make the best choice. If modular homes for Goldsboro families have taken your fancy, you might have some questions in mind before purchasing one. Are modular homes in Goldsboro the same as mobile houses? These two housing options are different. Unlike modular homes for Goldsboro residents that are built to local construction standards, mobile houses are built to HUD criteria. Additionally, as the name suggests, the latter can be moved anytime, anywhere. On the other hand, modular homes in Goldsboro are assembled piece by piece and placed permanently in a specific location. What makes modular homes in Goldsboro different from houses built on-site? The primary difference between modular homes in Goldsboro and site-built houses is that the former is constructed indoors. Since modular homes in Goldsboro are prefabricated, the construction time won't take as long as stick-built residences. As a result, modular homes for Goldsboro families tend to be less expensive than houses made on site. How strong are modular homes in Goldsboro? Modular homes for Goldsboro citizens are made with more reinforcement than on-site built houses. Since the goal is to deliver your manufactured residence safely, the house needs to be strong. The reinforcement done on modular homes in Goldsboro prepares it for the transportation-from the manufacturing site to your property. Can modular homes in Goldsboro be customized? Yes, homebuyers can request for customized modular homes in Goldsboro. Even though a manufacturer makes these houses, not all of them have a single design. Different manufacturers actually provide a wide range of styles and floor plans, allowing you to find modular homes in Goldsboro that are best suited for your lifestyle and budget. As a homebuyer, you can have full control over how you want your house to look. 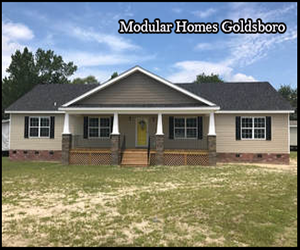 Since 2004, many clients have trusted Home Connections for affordable and quality modular homes for Goldsboro families. For a wide range of exceptional modular homes in Goldsboro, turn to us. We'll build the one that you like best. Our company understands how important it is to put a roof over your loved ones' heads. With our help, you will be providing them with more than just a shelter; you will give them a home that they would love to return to each day. Searching for the right house that you can live in for years to come might be challenging for some. If you have narrowed down your search to modular homes for Goldsboro families, that is great news! With that part settled, you can proceed to finding the perfect floor plan for your ideal residence. At Home Connections, we collaborate with outstanding manufacturers who offer floor plans for modular homes in Goldsboro. If you cannot find a floor plan that you like, send us a custom layout and we will build your dream house for you. See More Custom Modular Homes in Goldsboro Today! Do you have your eyes set on floor plans for modular homes in Goldsboro? Let Home Connections help you find the perfect house. If you are interested in our budget-friendly and top-notch housing, give us a call at 910-298-3387. For further inquiries, please visit our page at http://www.ourhomeconnections.com/. Formerly known as a trailer or mobile home, a manufactured house is a unit that's primarily or entirely constructed off-site and then transported to the final building site. These housing structures conform to the Manufactured Home Construction and Safety Standards, also called the HUD code. Manufactured homes also rest on a non-removable chassis that's designed for over-the-road transportation. Should the homeowner decide to reside in another area, manufactured homes can easily be moved on their wheels. At Home Connections, we put a premium on the satisfaction of our customers and strive to create lasting relationships with them. That's why we offer manufactured housing solutions that can give our customers the most value for their investment. If you purchase a manufactured unit from us, we'll go the extra mile to meet your housing preferences at a cost that won't hurt your finances. We at Home Connections work with a focus on quality and integrity. Apart from being a factory-built housing business, we're a licensed general contractor. Our staff of diligent professionals strives to complete every project down to the client's most minute specification. With our extensive knowledge in building codes, we also make sure that all our processes are performed in compliance with the law. Turn to our team for superb modular housing solutions, and let us construct your ideal home for unrivaled prices. Are you planning to buy a house? Live the American Dream with our economic and sustainable housing solutions! At Home Connections, your dream home is within your reach. Get in touch with us today at 910-298-3387. To get more details about our company, visit our website. We take pride in providing the finest modular homes at the fairest prices.